The first thing is to make sure the smell is sewer gas which is usually a rotten egg smell and not a natural gas smell which usually smells like a skunk. If you think it’s a natural gas smell, call Dominion Energy immediately (1-800-767-1689) and if it’s anything but a very faint smell, evacuate your home, office, or other space, and wait for the gas company to give you an all clear. A natural gas leak can lead to a violent explosion. Back to sewer gas. Actually, sewer gas is mostly methane which is odorless but it’s almost always mixed with other gases, the most common of which is hydrogen sulfide which has a rotten egg smell. Hydrogen sulfide comes from decomposing organic matter. Natural gas, for that matter, is odorless too. The skunk odor is actually a chemical called mercaptan that is added to warn of a leaking natural gas danger. Sewer gas odor can come from the lateral connected to the City’s sanitary sewer system. All urban and commercial/business buildings are tied into the City’s sanitary sewer system in the City of Green River. 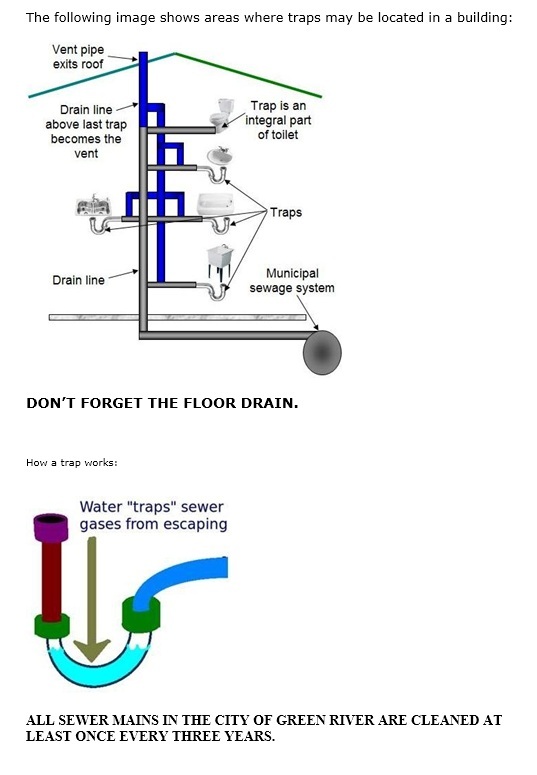 The most common source of sewer gas odors whether residential or commercial is a “dry trap!” A dry trap occurs when a sink, floor drain, or toilet is not used for sometime and the water trap in the drain line dries out and the sewer gas can then back up into the area. Another common source of sewer gas is a broken drain line that allows sewer gas into a crawl space, basement or mechanical area, that then seeps into the building. Plugged or backed up drains, high winds, and inversions can also push sewer odors back into buildings. Besides the offensive odor, sewer gas can be hazardous especially over any extended period of time. Methane gas can displace the oxygen especially in a confined space and be deadly. Hydrogen sulfide is also toxic. Fortunately we can generally smell Hydrogen Sulfide (H2S) at very low levels and far below what could be toxic. As the H2S gets stronger our ability to smell it is lost. Methane and hydrogen sulfide are also explosive in the higher concentrations. If you smell sewer gas (rotten eggs), check for dry traps, add water to fill the traps. This will block the path for the gas to escape. If that doesn’t work, it could be a broken line, a vent that is plugged or not vented to the outdoors, a dead animal somewhere, or even worse some other source of hydrogen sulfide than a sewer system. It may be time to get help from someone who can inspect for possible sources, a plumber or contractor.